LOS ANGELES — Prominent promoters Bob Arum and Eddie Hearn put differences aside to coordinate Friday’s main event between Vasiliy Lomachenko and Anthony Crolla that will be streamed on ESPN+ from Staples Center. While Crolla shadow boxed in the ring during his media workout on Tuesday, Arum and Hearn were a few feet away discussing their next big fight. The two sides are hoping for a super middleweight unification bout between England’s Callum Smith and Mexico’s Gilberto Ramirez later this year in London. “What we were talking about there was Ramirez against Smith in a unification fight, which is just a brilliant fight, and (Arum) basically said to me, ‘We want to make that fight,’” Hearn told BoxingScene.com. “We’d be prepared to make that fight in the U.K.
Ramirez, who’s promoted by Arum’s Top Rank, is the reigning WBO champion, but is scheduled to make his 175-pound debut in Friday’s co-main event against Tommy Karpency. Smith, the WBA champion promoted by Hearn’s Matchroom Boxing, said he was told by Ramirez he would return to 168 pounds to make the bout happen. 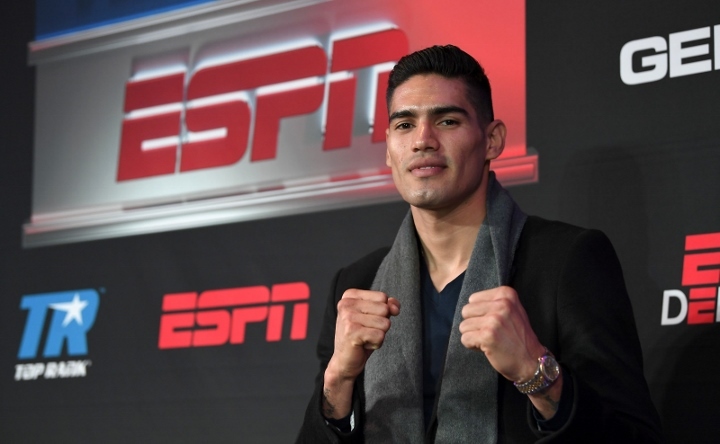 “I met Gilberto Ramirez (Monday) at the gym, that’s a fight that I would like,” said Smith, who was in attendance Tuesday to support his stablemate Crolla. “I’m a big fan of Ramirez. He’s a good fighter. Smith hasn’t fought since defeating George Groves in the World Boxing Super Series finale in September. Smith is scheduled to fight against an opponent to be named later on the Anthony Joshua-Jarrell Miller undercard in Madison Square Garden on June 1. With Hearn doing business with DAZN and Arum aligned with ESPN, Hearn said he wouldn’t let networks get in the way of this potential super middleweight unification bout. But the two promoters are already in agreement with the location and venue, often big hurdles in cross-promotion bouts.